Our governance structure has changed a great deal since our founding in 1936. In 2016, our members on more than 50 boards and committees help shape ABIM’s programs and policies. It is a diverse group of physicians and public members (including patient advocates, allied professionals and non-internist physicians) and we thank them for their guidance and service. The founding ABIM Board of Directors consisted of nine men, all of whom were from academia. 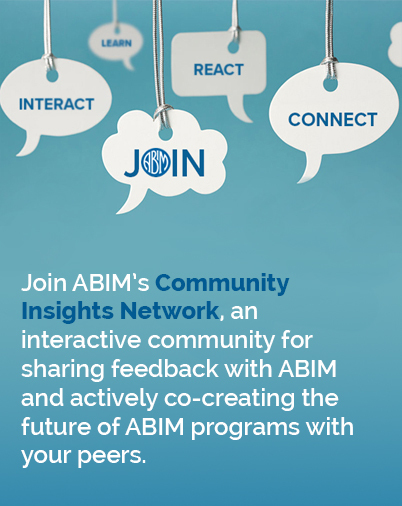 92% of ABIM’s physician governance members provide direct patient care. Our governance members hail from every region of the continental US, which helps bring rural, urban and other perspectives to our work at ABIM. Data circa August 2016 and is subject to change. Of the 365 unique ABIM governance members, several sit on multiple boards or committees. ABIM’s programs are informed by a diverse range of physicians, some of whom are certified by other boards. All members must comply with the MOC Policy for Physicians Serving ABIM. “Other” denotes an individual with a job function not outlined in the survey including a faculty position, consultant, society leader, retiree and those with multiple roles. Public members include patient advocates, allied professionals and non-internist physicians.